Paris is called the City of Light**. That includes the streetlights of Paris, the lights illuminating the buildings of Paris, and the way the lights transform the streets of Paris at night. The detail of the streetlights vary by location. The older the area, the more ornate the light standard and the lights. Some of the streetlights near the Louvre have crowns at the top, perhaps reminiscent of when the museum was a palace. Other streetlights on the bridges have a more elaborate design, such as the Pont Alexander III. The warmth shows at the windows of the bistros, and spills out onto the tables and chairs outside under the awnings. You are beckoned to the light, the warmth, the camaraderie, and the smell of good food. Night lighting brings details to the fore and reminds us of this building's infamous burning. In 1871, the Paris Commune chose the Hôtel de Ville as its headquarters and as anti-Commune troops approached, the Communards set fire to the building, destroying records from the French Revolutionary period. All that remained afterward was a gutted stone shell. (from Wikipedia and other references). Communards = members and supporters of the Paris Commune, which lasted from March 18 - May 28, 1871. Floating down the Seine River on a Bateau Parisienne tour boat, we see the Alexander III Pont (bridge) . . .the water reflects the illumination highlights, like a Monet water scene. Do you know of other cities which illuminate or use artistic lighting to enhance architecture, especially in the evening? Please leave a comment to let me know you stopped by, and if you are part of the A to Z Challenge. I'll be sure to check your blog, and reciprocate. If you're not in the challenge, thanks for stopping by to visit! I try to reply to all comments. 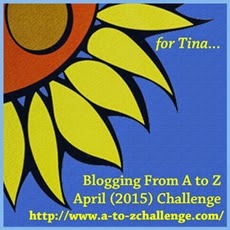 The A to Z Blog Challenge is brainchild of Lee, at Tossing It Out. Please visit the A to Z blog site to find out more information and the participant list. There are also Twitter and Facebook presences if you want to check those! San Francisco is lovely at night....Market Street all lit up like a river of gold. And Frisco is on my list of places I love, JoJo. It's got a lot in common with Vancouver, too.I didn't know about Market Street though, I'd like to see that! The city of lights. So beautiful. Most cities with lots of light look good at night, but Paris is especially so. I agree, LG. Glad you agree, Chrys. I liked seeing the lights from the Seine River perspective. Paris at night is magical. Diana Krall did a concert there, and the glimpses she gave of Paris at night made me want to go there. Even my Duck Dynasty supervisor visited with his two young daughters and sang of its beauty. It is beautiful, Roland, and they work to make it so. Paris also loves musicians. Of course you should go there one of these days. . I need another dose of Paris too. A night cruise would be a lot of fun. That light in the first photo is really impressive. I thought so too, Alex, and many of their streetlights are impressive. Reminds me of Victorian times. Great example, and we're baseball fans, btw. I've never been to the windy city, so this is good to know, thanks for the info, John. I love this post. Your pictures are so beautiful and enhance everything you are saying here. If I never wanted to visit Paris in the past (not the case), the beauty and warmth of these fantastic 'lighted' pictures sure makes me want to book a trip today. I started out thinking this (the first picture) was y favorite), but as I scrolled down each successive pic became my 'new favorite' the minute they came into view. Absolutely stunning! What a way to illuminate you 'L' post. Great job! That makes my day, FAE! I'm glad I captured the essence of Paris at night. When you have time, check out the Paris Post tab at the top of my blog page. (more images). The first photo is one of my faves. . .
That photo of the lights on the river is almost like a painting! So beautiful. Cairo doesn't do a bad job of lighting, especially Downtown, and the bridges and the boats/houseboats on the river, look lovely in the evening. Ismail Pasha the ruler in the 19th century built that area to resemble European capitals, he was educated in Paris and I believe was a noted Francophile :) But nothing can compare to Paris. Just the sound of Cairo at night sounds exotic,Nila, and how interesting that the ruler you mentioned had been educated in Paris. Paris seems to get into your heart and stay in your memories. Ah, Paris. How beautiful. This is such a weird coincidence. I just visited Chis's blog theme of disasters. Last week was spring break for my kids. My daughters were in Paris enjoying the beautiful lights and sights while my boys and I took off to our fishing cabin on the lake. We had to evacuate because of a tornado. We were stuck at the lake for several days after the tornados passed, without internet or cell service. We didn't even have television. I would so much rather have been in Paris. In New Orleans, beautiful flambeaux, gas lanterns illuminate the streets. One day,maybe I'll get to see that. I think I'd rather be in Paris than in a tornado, anyday! Hi D.G. I've done a lot of travelling and have never seen a city make quite the effort Paris does. Australian cities do the illuminations for a short festival, such as Sydney's Festival of Lights which is coming soon. To see the Opera House illuminated with artworks is quite the sight! Wish it was permanent, but alas. Our bridges in Brisbane are illuminated for special events such as Armistice Day where they are swathed in red poppies. Some of the Asian cities do lighting amazingly, like Hong Kong and Shanghai for example. But Paris. No better. Love gazing at Pont Alexander III and taking a night cruise to see the lights on both banks. Hmm... When is my next trip? I trust your travelling judgement, Denise, and I like the Pont Alexander III as well, and a lot of the other bridges, too. . .lucky you getting to travel a lot. I'd like to see London too, hoping if I don't get there my sister will. She wants to visit England and Scotland as we are descended from three lines of Scottish in our family in Georgia, USA. I bet the cruise on the Thames would be fantastic. I watch BBC a lot, too.